Republic of Ireland, 1976. John Fryer murders a boy, leaving his body in a bog, under a rock. Soon after, he is pursued by an entity he names The Moley, demanding blood. Fryer starts to cut himself, and ends up in the Belfast Heights Psychiatric Hospital. Belfast, present day. Christopher Aaron Moore is not happy with the peace process in Northern Ireland, and what it did to his father, once a decorated RUC officer, now dead by his own hand. Having married a Catholic, he was shunned by his own family, as was Christopher. 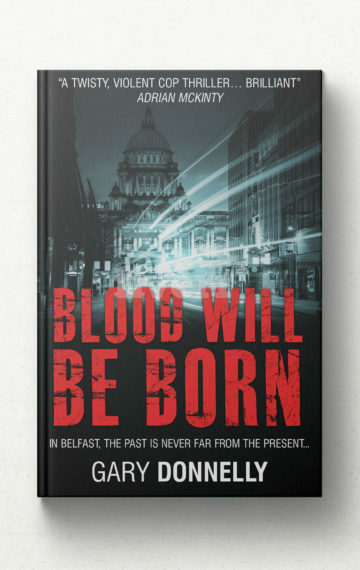 Now Christopher hears his father’s voice, reminding him of the old days, and giving him a mission; to derail the fragile peace in Belfast. And Christopher knows exactly how he is going to do it. The first step is killing the grandmother who turned her back on him, and then getting rid of his Uncle Cecil, now top brass with the outlawed paramilitary Ulster Defence Association. The police suspect Cecil of being a drug runner, but cannot prove it. But Christopher needs help to bring chaos to Belfast, and he knows exactly who he needs: John Fryer, who has his own score to settle. Jim Dempsey, the man Fryer worked for, killed the boy for, back in the day, had Fryer committed. Forgot about him. And Fryer wants to get even. So Christopher breaks him out, and soon, all hell is breaking loose in Belfast. DC Aoife McCusker has just received a promotion to Serious Crimes. Unfortunately, a brief affair with her former boss has her colleagues thinking she slept her way to the promotion. Her first case is a murdered and tortured elderly woman, the mother of Cecil Moore, who just happens to be blackmailing McCusker. But McCusker is about to prove she can only be pushed so far. And into this comes DI Owen Sheen, on loan from the Met. He’s working for the Serious Historical Offences Team, but he has his own agenda. His only brother was killed while playing football in the street, killed by an IRA bomb in Sailortown, the working class area of Belfast, when they were young. His family fell apart, and he moved with his father to England, promising him never to go back to Belfast. But now his father is dead, and Sheen means to get the men who killed his brother.